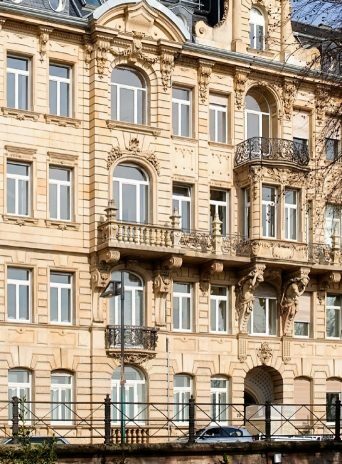 We are conveniently located in the city center of Frankfurt and in close proximity to the banking district. Our offices are housed in an historic building directly on the banks of the river Main. You can reach us by taxi from Frankfurt airport in approximately 20 minutes and from the Central Railway Station in approximately 5 minutes. We recommend that you utilize the convenient public parking facilities “Untermainanlage” or “Am Theater”, which are very close to our offices. From the airport, take S Bahn line 7/8/9 to the Central Railway Station (Hauptbahnhof) and from there U Bahn line 4/5 or tram 11/12 to Willy Brandt Platz. From the Central Railway Station (Hauptbahnhof) take U Bahn line 4/5 or tram 11/12 to Willy Brandt Platz.